Lot Detail - Gary Howatt's 1979-80 New York Islanders Game-Worn Stanley Cup Finals Jersey with LOA - Photo-Matched! Gary Howatt's 1979-80 New York Islanders Game-Worn Stanley Cup Finals Jersey with LOA - Photo-Matched! Gary Howatt made his mark during the 1980 post-season, scoring three goals and tallying 84 penalty minutes as the Islanders captured their first of four consecutive Stanley Cup victories. Offered is Gary’s white mesh and knit combo Goodman’s-made jersey featuring the spectacular Lake Placid Olympic Winter Game patch on the left shoulder. Two-tone letters across a mesh plate spell out "Howatt" above the number 8 and a nine-inch meandering team repair runs along the left side of the back number. Heavy canvas snap-style fight strap is sewn into the back and we also see heavy interior pilling. The right sleeve shows black marks, a scrape on the sleeve number and a board burn. Two more marks and pilling near the cuff can be found on the other arm. More black marks cross the lower front along with an unrepaired hole. This special jersey has been video-matched to game footage taken during the Cup-clinching Game 6 and to May 24th 1980 Game 6 Getty Images #51716480. Comes with three different letters of authenticity. Please take note that this item may be subject to a silent reserve. Comes complete with a package of authenticating documents from MeiGray Vintage including a photo COA showing a Getty Images photo-match and two more LOA’s from Byron’s Hockeyland and Spivack & Kraut. 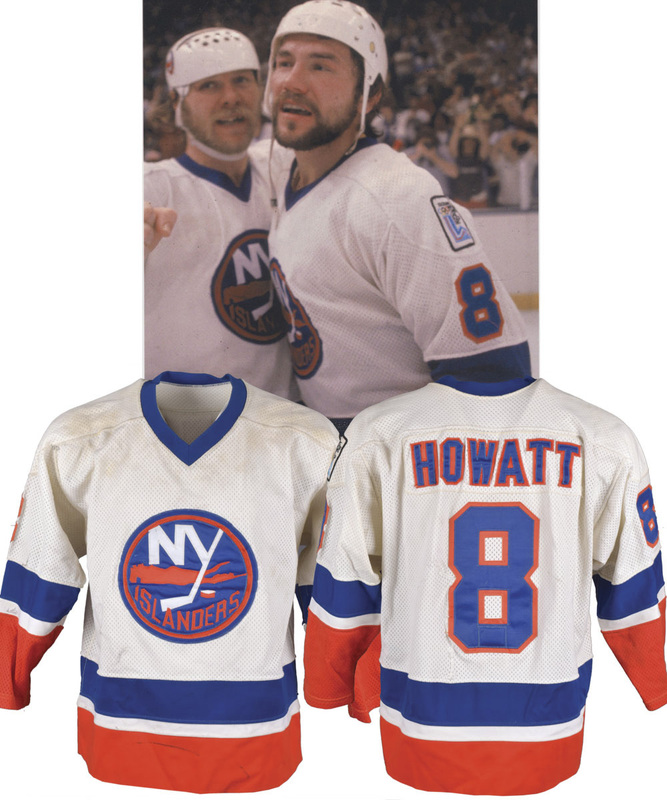 Howatt enjoyed his greatest popularity with the Islanders, remaining on the team from their first season, through their formative years of steady improvement, right through to their first two Stanley Cups, in 1980 and 1981. Howatt, known along with teammate Bobby Nystrom as a member of the "Dynamic Duo", was a fan favorite admired for his scrappy, energetic style of play.